Reversible bow ties are made from two distinctly designed fabrics each with an outstanding look of it's own, but when combined something amazing happens. An absolutly gorgeous complimenting work of art is created. Now you have the ultimate reversible accessories capable of complimenting and accenting even more outfits in your wardrobe. Reversible bow ties are becoming a must have for bow tie lovers everywhere. Now you can add it's distinction and beauty to the outfits you like to wear. Have your reversible bow ties custom made just for you. Choose from two options. Option 1. - Use the necktie conversion package using two of your own neckties converted into one reversible bow tie. Option 2. 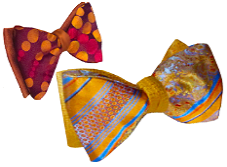 - Select two fabrics you would like us to use and create your own unique reversible bow tie. I want two neckties of my own converted to one reversible bowtie. I want my reversible bowtie made from two fabric selections from the fabric swatch on this page. I want my reversible bowtie pre-tied and velcro adjustable. I don't want my reversible bowtie pre-tied and velcro adjustable. 3. If you would like to convert several neckties into several reversible bowties submit this form once for each reverisble bowtie or contact us at 443-708-0988 for assistance. 4. Submit your order: and pay via Paypal. Copyright 2011 Randolph Accessories, LLC, all rights reserved.